(Trent Nelson | The Salt Lake Tribune) BYU hosts Northern Illinois, NCAA football in Provo, Saturday Oct. 27, 2018. (Trent Nelson | The Salt Lake Tribune) Brigham Young Cougars running back Matt Hadley (2) is tackled as BYU hosts Northern Illinois, NCAA football in Provo, Saturday Oct. 27, 2018. 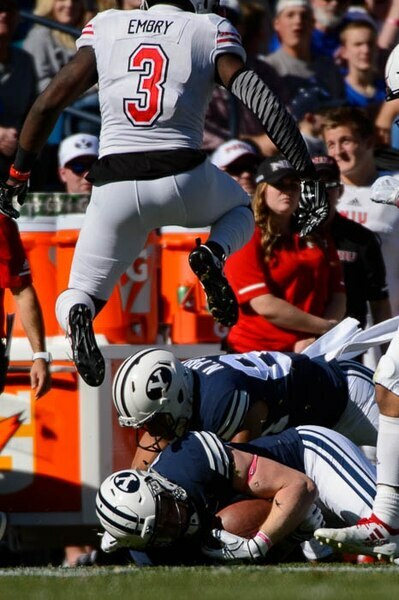 (Trent Nelson | The Salt Lake Tribune) Northern Illinois Huskies cornerback Jalen Embry (3) leaps over Brigham Young Cougars tight end Matt Bushman (89) as BYU hosts Northern Illinois, NCAA football in Provo, Saturday Oct. 27, 2018. (Trent Nelson | The Salt Lake Tribune) Brigham Young Cougars tight end Matt Bushman (89) as BYU hosts Northern Illinois, NCAA football in Provo, Saturday Oct. 27, 2018. (Trent Nelson | The Salt Lake Tribune) Brigham Young Cougars head coach Kalani Sitake as BYU hosts Northern Illinois, NCAA football in Provo, Saturday Oct. 27, 2018. (Trent Nelson | The Salt Lake Tribune) Brigham Young Cougars running back Matt Hadley (2) as BYU hosts Northern Illinois, NCAA football in Provo, Saturday Oct. 27, 2018. (Trent Nelson | The Salt Lake Tribune) Brigham Young Cougars quarterback Zach Wilson (11) as BYU hosts Northern Illinois, NCAA football in Provo, Saturday Oct. 27, 2018. (Trent Nelson | The Salt Lake Tribune) BYU defenders leap in an attempt to block a field goal by Northern Illinois Huskies place kicker Andrew Gantz (2) as BYU hosts Northern Illinois, NCAA football in Provo, Saturday Oct. 27, 2018. The kick was no good. (Trent Nelson | The Salt Lake Tribune) Brigham Young Cougars quarterback Zach Wilson (11) as BYU hosts Northern Illinois, NCAA football in Provo, Saturday Oct. 27, 2018. (Trent Nelson | The Salt Lake Tribune) Brigham Young Cougars defensive lineman Corbin Kaufusi (90) sacks Northern Illinois Huskies wide receiver Cole Tucker (18) as BYU hosts Northern Illinois, NCAA football in Provo, Saturday Oct. 27, 2018. (Trent Nelson | The Salt Lake Tribune) Brigham Young Cougars defensive lineman Corbin Kaufusi (90) sacks Northern Illinois Huskies wide receiver Cole Tucker (18) as BYU hosts Northern Illinois, NCAA football in Provo, Saturday Oct. 27, 2018. (Trent Nelson | The Salt Lake Tribune) Northern Illinois Huskies wide receiver Jauan Wesley (9) leaps for a reception ahead of Brigham Young Cougars defensive back Chris Wilcox (32) as BYU hosts Northern Illinois, NCAA football in Provo, Saturday Oct. 27, 2018. (Trent Nelson | The Salt Lake Tribune) Brigham Young Cougars quarterback Zach Wilson (11) throws the ball away as he's brought down by Northern Illinois Huskies linebacker Kyle Pugh (57) as BYU hosts Northern Illinois, NCAA football in Provo, Saturday Oct. 27, 2018. (Trent Nelson | The Salt Lake Tribune) Brigham Young Cougars quarterback Zach Wilson (11) is sacked as BYU hosts Northern Illinois, NCAA football in Provo, Saturday Oct. 27, 2018. (Trent Nelson | The Salt Lake Tribune) Northern Illinois fans cheer in the fourth quarter as BYU hosts Northern Illinois, NCAA football in Provo, Saturday Oct. 27, 2018. (Trent Nelson | The Salt Lake Tribune) BYU players on the sideline in the fourth quarter as BYU hosts Northern Illinois, NCAA football in Provo, Saturday Oct. 27, 2018. (Trent Nelson | The Salt Lake Tribune) Northern Illinois Huskies cornerback Antwain Walker (26) celebrates after a fourth quarter interception as BYU hosts Northern Illinois, NCAA football in Provo, Saturday Oct. 27, 2018. (Trent Nelson | The Salt Lake Tribune) Brigham Young Cougars wide receiver Neil Pau'u (84) after the 7-6 loss as BYU hosts Northern Illinois, NCAA football in Provo, Saturday Oct. 27, 2018. (Trent Nelson | The Salt Lake Tribune) Northern Illinois Huskies linebacker Kyle Pugh (57) brings down Brigham Young Cougars running back Squally Canada (22) as BYU hosts Northern Illinois, NCAA football in Provo, Saturday Oct. 27, 2018. (Trent Nelson | The Salt Lake Tribune) Brigham Young Cougars running back Matt Hadley (2) after the 7-6 loss, as BYU hosts Northern Illinois, NCAA football in Provo, Saturday Oct. 27, 2018. (Trent Nelson | The Salt Lake Tribune) Brigham Young Cougars quarterback Zach Wilson (11) leaps over Northern Illinois Huskies safety Trayshon Foster (11) as BYU hosts Northern Illinois, NCAA football in Provo, Saturday Oct. 27, 2018. (Trent Nelson | The Salt Lake Tribune) Brigham Young Cougars quarterback Zach Wilson (11) runs the ball as BYU hosts Northern Illinois, NCAA football in Provo, Saturday Oct. 27, 2018. (Trent Nelson | The Salt Lake Tribune) Brigham Young Cougars long snapper Matt Foley (64) yawns on the sideline as BYU hosts Northern Illinois, NCAA football in Provo, Saturday Oct. 27, 2018. Provo • Freshman quarterback Zach Wilson hurdled one Northern Illinois defender and stiff-armed another in virtually the same motion, and BYU was in business at the NIU 5-yard-line with about five minutes remaining in the third quarter. A lethargic and mostly-bored crowd of 51,084 came to life. But after two false starts, an incomplete pass, an 11-yard pass and a trick play that didn’t work, the Cougars had to settle for a 22-yard field goal to trim the deficit to a point. They would never score again. 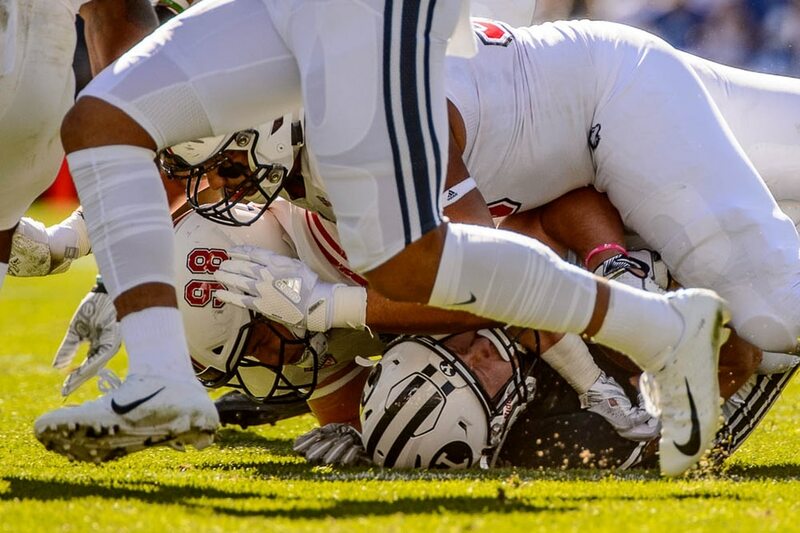 The costly miscues and suspect play-calling in the red zone turned out to be symbolic of an ugly afternoon for the Cougars, who unbelievably were ranked No. 20 in the country a month ago. So the visiting Huskies, a Mid-American Conference power without much of a national profile, stunned BYU 7-6 on Saturday afternoon to even the Cougars’ season record to 4-4 and head coach Kalani Sitake’s overall record to 17-17. 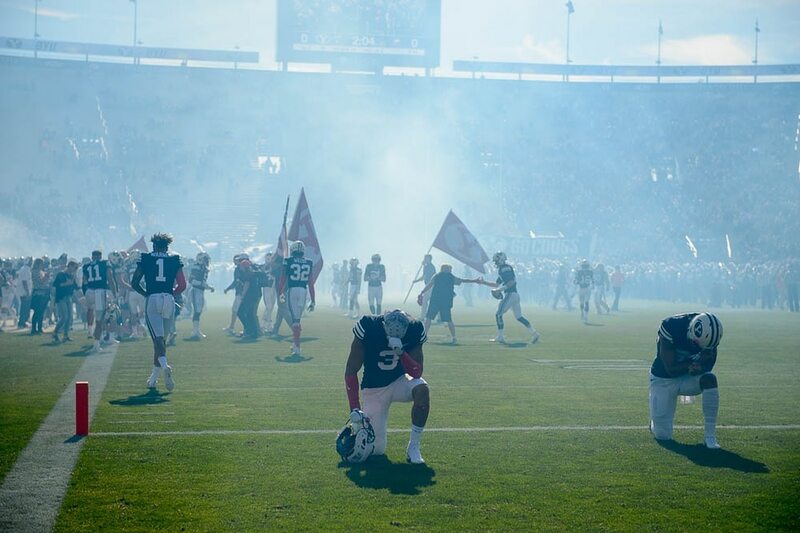 The Cougars, who have dropped seven of their last nine games at LaVell Edwards Stadium, had one last chance with a minute, 47 seconds remaining after taking over on their own 33. But Wilson’s first pass of the series was intercepted by safety Mykelti Williams and the Huskies (5-3) were celebrating their first non-conference win of the season moments later. Across the way, the Huskies celebrated their biggest win of the year. The Huskies picked up just 204 yards and saw a long field goal carom off the uprights in the first half, but basically won the game with a 65-yard touchdown drive to open the second half. Quarterback Marcus Childers’ 1-yard plunge was the game-winner with 11:19 remaining in the third quarter. The TD came after the Cougars had apparently stopped NIU on third-and-goal when a pass fell incomplete. But Chris Wilcox was flagged for defensive holding in the end zone, and the visitors had new life. Wilson threw a 42-yard strike to Talon Shumway and BYU moved to the NIU 5 on Wilson’s aforementioned highlight-reel run. Brady Christensen and Tristen Hoge were flagged for back-to-back false starts and Wilson’s first-down throw to Squally Canada was low. Neil Pau’s 11-yard catch got the Cougars to the 4, but a throw-back, tackle-eligible pass to Christensen didn’t net anything and Sitake chose to take the chip-shot field goal from Skyler Southam. He was referring to the game as a whole and not that non-gamble or two other non-aggressive decisions in the fourth quarter. He sent Southam back in for a 51-yard field goal try with 9:27 remaining and BYU trailing 7-6, but it sailed wide right. Then, on fourth-and-4 from the 46 with around three minutes remaining, he punted. That decision proved to be the right one because the Cougars stopped NIU and forced the punt with just under two minutes remaining. Then Wilson threw the interception. And suffered another humiliating defeat.